Crunchy cod, cucumber and cabbage sandwich. Plus bread and teriyaki sauce, but those aren't as cutely alliterative. Takahachi Bakery stands out in the neighborhood with its bevy of matcha custard desserts and fresh-baked breads and cakes and macarons. It also has an eclectic lunch menu that features odd baked items like corn-mayo buns, octopus-ball buns, and wasabi blt's. They're all worth a try, especially if still warm from the oven, but I often turn to the sandwiches, such as the one shown in the photo above. Takahachi always carry one sandwich that looks like this, though it sometimes contains potato or another creamy filling, and sells at an exceedingly reasonable price (I think I paid $3.95.) The bread is pillowy and soft, and has a taste similar to Wonder Bread - as pointed out by Andrew Coe at Serious Eats - To balance this softness out, they add a lot of crunchy toppings to the sandwiches, like the cabbage and cucumber in this version. 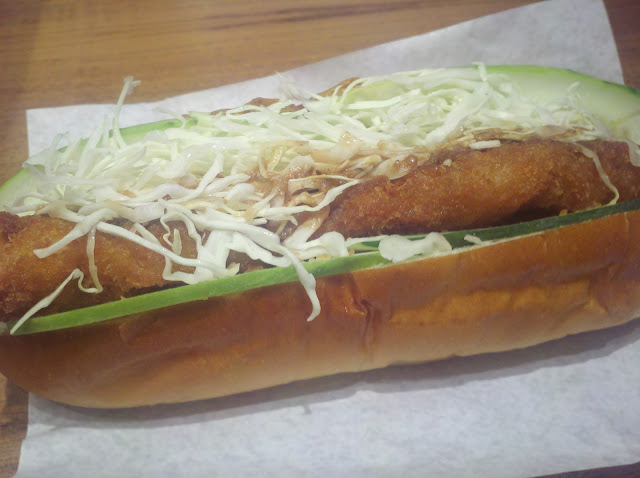 It's a nice sandwich with a balance of creaminess and crunch, fried but still light, and when you're not getting the soft-shell crab sandwich with avocado, it's a good bet. It also left enough room in the wallet for a taste of dessert. Skipping over the matcha crepes, the orange-wasabi cakes, the melon pan, the mochi an-pan, the chocolate pudding and whipped cream filled choux pastry, or any of the red bean-filled baked buns, I opted for one of their chocolate chip cookies, instead of the usual miso-almond cookie I tend to crave. 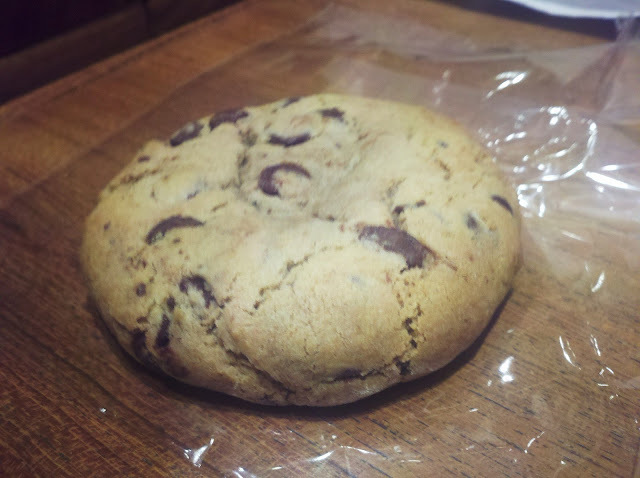 ﻿ The cookie has a nice semi-firmness, so there's just enough chewy pull on the inside, but the outside is still crisp. Like just about everything else at Takahachi, it's hard to fault it. Not a monster like the decadent (and delicious) ones at Levain Bakery or Jacques Torres, but a simple, well-made cookie. I approve. I imagine it would be very good with the coffee and espresso they sell, which I have yet to try. The total bill for this lunch came to around seven dollars once I added in the iced barley tea (I am willing to take my barley in tea form as well as beer form, thank you very much.) If you're ever looking for something to nibble on, and you're absolutely nowhere near the Triangle Below Canal Street, but very near City Hall Park, give Takahachi Bakery a try.